Caption: (Left to right) IWLA Vice Chairman Clifford Otto and IWLA Immediate Past Chairman Rob Doyle, CWLP, present Kathy Fulton, executive director of ALAN with the $25,000 check from IWLA. Congratulations! 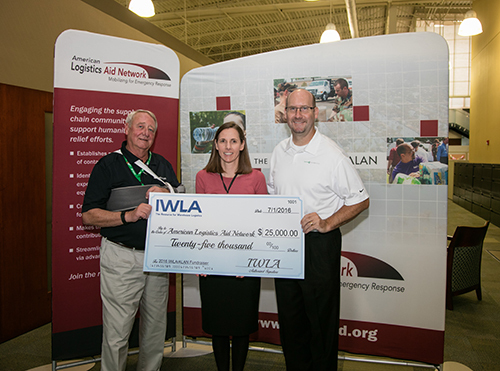 IWLA members showed their support of the American Logistics Aid Network (ALAN) with a total donation of $25,650 raised since the IWLA Convention & Expo in March. In honor of the 125th Anniversary, IWLA pledged to commit up to $25,000 to the nonprofit and encouraged members to donate resources and financial contributions. This makes the combined IWLA-related donation $50,650 since mid March. The IWLA pledge will continue for the next two years with up to $75,000 total matched. Thank you to the participating IWLA member companies.